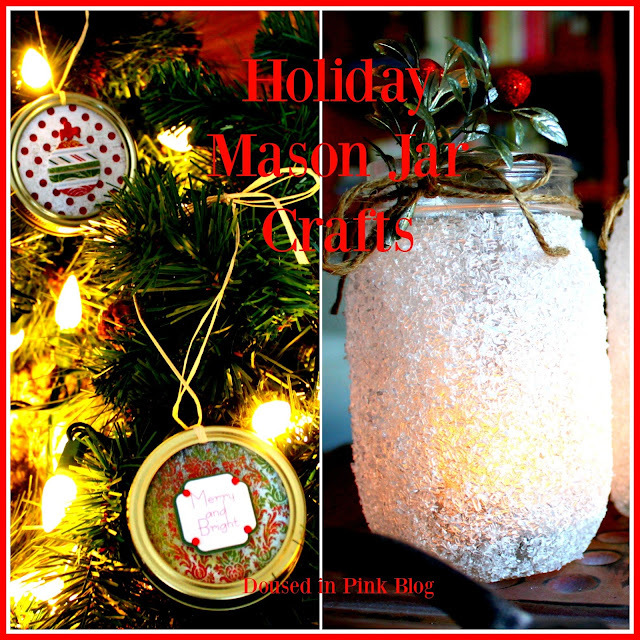 Holiday Mason Jar DIYs & 12 Days of Giveaways - Day 8! Mason jar crafts are one of the easiest and cost friendly ways to decorate for any holiday. Last year I shared a winter snow scenes tutorial (see my post here), and this year I'm going to show you how to make snowflake tea light holders and ornaments using mason jars. We had our first annual family craft night last week and I took the lead and we made some easy holiday crafts using mason jars. We also made holiday shadow boxes. I'm going to try to get that tutorial posted soon! Remove the mason jar lid. You will use it for the second craft. Brush a thick layer of mod podge over the jar. Immediately roll the jar in the epsom salt until thoroughly coated. Decorate with holiday greenery and twine. Add a tea light and enjoy! Pick out paper, trace around the mason jar lid and cut out. Tape or glue the paper onto the jar lid. Tie twine or raffia around the jar lid band and tie off on top so you can hang it. Apply some glue inside the lid band, insert the circle and let dry. Glue a holiday embellishment to the front of the ornament. That's it! So easy to make! Hang your ornament on your tree and enjoy the sense of accomplishment on making it yourself! Here's some of the ornaments that my family made! Welcome back to 12 Days of Giveaway's! Before we get to the giveaway, check out today's featured blogger, Lee from LegalLee Blonde! Today's giveaway is a fur lined poncho from Tulip! Based in Kansas City, their shop features fun and fashionable clothing.